Wherever you go, the beverages and tunes come along for the ride when they"re in the Picnic Plus Cooladio Radio Cart. Featuring an AM/FM radio and dual speakers, that also plays your iPod ® , MP3 or CD player with the included input cables. 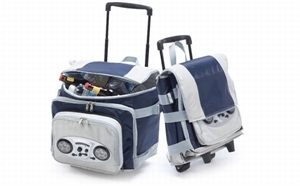 The large insulated cooler with a 60 can capacity, this Picnic Plus Radio Cart keeps your food and drinks cool and your music hot. Great for beach, camping and boating trips, the Cooladio Cart collapses flat for convenient storage! With a retractable handle and rugged wheels - ideal for when you"re on the go! Want to add some Gourmet Snacks ?